I was invited to attend the Blogger Week conference today, which provided some really good information (I will share my experience Monday). In my attempts to somewhat prepare, I realized that I haven’t actually carried a purse/handbag since I had Kai. With a diaper bag there pretty much wasn’t any need for one along with all the items you carry when having a baby. Then as of recently a friend jokingly asked me why I was still lugging around my huge diaper bag (old habits die hard). With a toddler I’m learning less is more. So I’ve been on a search for a new “diaper bag” and couldn’t find one…well more like the ones I’ve found are out of my price range I’m willing to pay right now. Until I found this gorgeous bag the other night at Target!! It was on clearance ($11) plus a 10% discount, because there was a defect with a strap. It is large enough to carry all I need and I’m sure more. I think my plan of attack will be compartmentalizing the inside with pouches such as my Gussy Sews pouch (I adore that thing!). Though those are not being sold anymore there are tons of tutorials and other shops that sell them as well, so fear not! 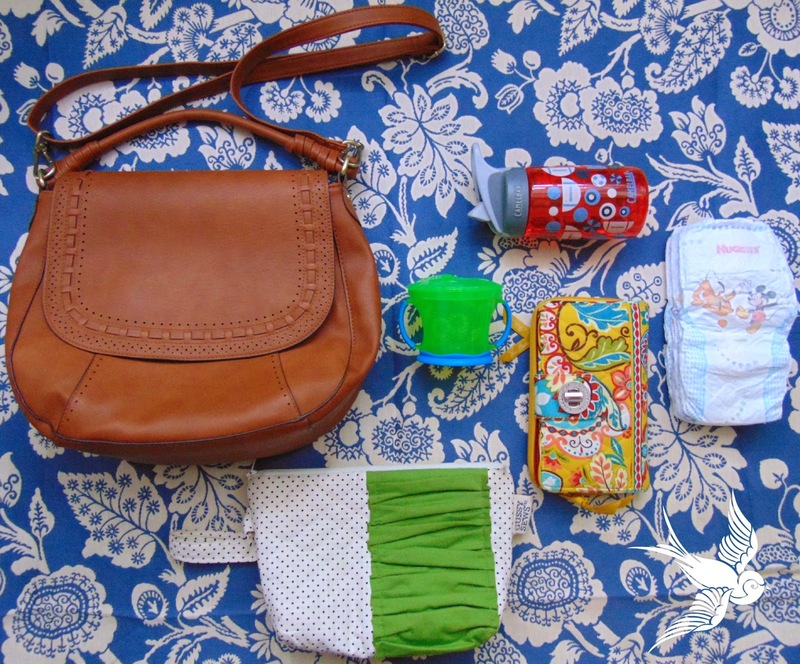 Finding the perfect handbag is so hard with a kid simply because you’re packing for the unknown. I’m looking forward to at least traveling in style now!